For information on creating fields and tables, see help for Range Names. Prior to Microsoft Office 2007, Microsoft Word and Excel's default file extensions were .doc and .xls, respectively. With the release of Office 2007, Microsoft introduced two versions of these file types, one whose extension ends with x and one whose extension with m. The .xlsx or the .docx files are Office documents that contain XML capability. The .xlsm and the .docm files are Office documents that contain XML capability AND macro capability. Narrative1 uses macros in both Microsoft Word and Microsoft Excel. 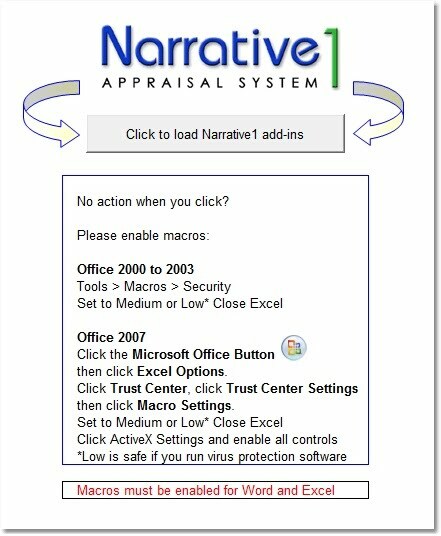 Therefore, if Narrative1 is running on an Office 2007 or later instance, files that are dependent on Narrative1 functionality must be saved as an Office 2003 or earlier format (.xls or .doc) or as a .xlsm/.docm. If a Narrative1 document is saved in a .xlsx or .docx format, the Narrative1 functionality will no longer be available for use in that document. 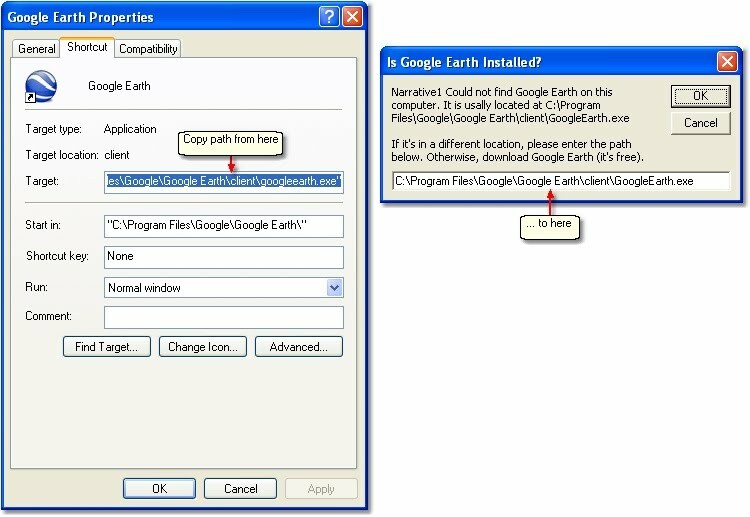 Right click on the Google Earth icon and select properties, select the target or path that ends with .exe and copy it. When the window comes up indicating an incorrect path, paste the copied path as shown below. 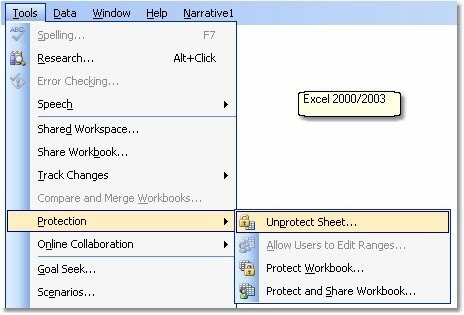 Sheets will automatically re-protect the next time it is activated, unless all worksheets have been protected via Options. To create a second instance of a worksheet, start by right-clicking on the sheet tab. With Excel 2003 you may see a warning regarding cells with more than 255 characters. Cells with more than 255 characters are usually the comparable sale comments. The simplest way is to repopulate the comp data from the database. Link the New Worksheet to Word: You will probably need corresponding Narrative for the new Excel worksheet! See Map Fields & Tables. By default, the Narrative1 template displays three comps for Land, Sales and Leases. New users often assume that the number of comps used in Excel automatically display in Word. Nope, just three, unless you modify you template. Run Fields and Tables (Remember you need to Save Fields & Tables In Excel first). 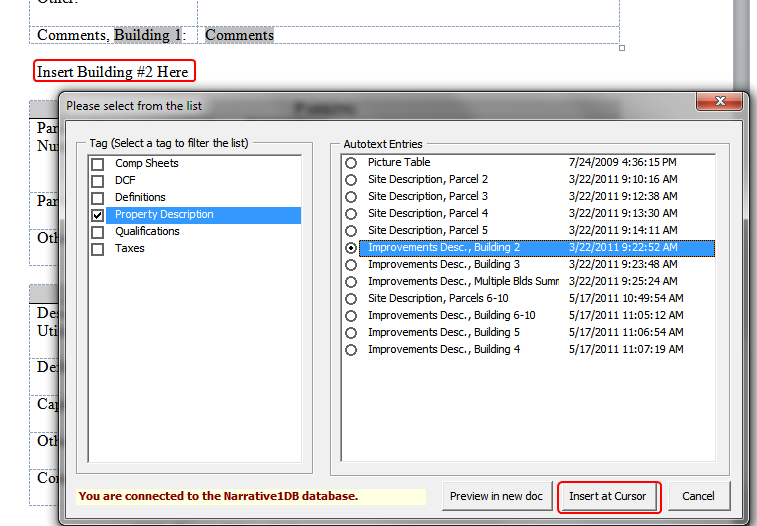 Property description sections for Land and Improvements may be found in Narrative1 autotext for builds published after May 2011. To update your autotext, click this link. Simple place the cursor where the property description narrative belongs, find the appropriate autotext and click "Insert at Cursor"
We license to the user, not to a computer. We want you to use the software wherever you need to work. A license allows you to install the software on computers used by your support staff (secretary, data entry person, etc.) There is no additional fee for support staff use. Support staff does not include appraisers. We could add a lot of legalese here, but lets keep it simple and fair. If a person is writing appraisals with the software, they should have a license. Please make a careful and informed purchase decision as all sales are final. If you have questions, please call 1-603-968-7462, 9 to 5 eastern time. Note that when you branch off and customize a template, new features that are not spreadsheet level work will still be available to you. For example, most database features are not programmed at the spreadsheet level, but rather are "add-in" based. These and other new features will run from your customized template. A word about backups: Save backups often, using a unique name for each backup. An easy method is to right-click on the file name via Windows Explorer and select Copy, then right click again and Paste. Windows will rename the file "Copy x of myfile" each time, and you can do while the file is open. This way if a file becomes corrupt (rare, but it does happen) or if there is an error that you created without realizing it, your backup won't over-write your previous backup and you can roll-back to various points in time. Windows & MS Office stores temp files and accumulate over time and can slow your system down. Click Start Run and enter %temp%. This will open the folder with temp files and folders. Type Control-a (this will select all the files and folders) and press the delete key. Often a temp file will be in use and stop the delete process; if you sort the files by date and select all the files that are older than the last reboot, you should be able to delete the bulk of the temp files. Click Start Run and enter %temp%. This will open the folder with temp files and folders. Type Control-a (this will select all the files and folders) and press the delete key. Find an instance of the field that you'd like to change. Select all and press Alt-F9 to toggle all field codes. Copy the field code to the clipboard. Paste the field code into the Find text box, and then put the replacement fields in the Replace dialog box. Find each field one by one and replace them with the desired field code. When finished, select all and press Alt-F9 to toggle all field codes. Note: Be sure to close all Word, Excel, Outlook and Internet Explorer files before running this utility. This will open an Excel files with a prominent button labeled "Click to Load Narrative1 add-ins". After this utility runs, it will automatically close Word and Excel. To manually enable Narrative1 add-ins, follow the instructions below. NOTE: Only do this if the above method does not work for you. From the menu bar, select Tools | Templates and Add-ins... The Templates and Add-ins window displays. If the add-ins are not listed, click on the Add... button. Browse to the add-ins listed in step 2 (usually found in C:\Program Files\Narrative1) and select them. Click on the Open button. Check off these new add-ins and click on the OK button. From the menu bar, select Tools | Add-ins... The Add-ins window displays. If the add-ins are not listed, click on the Browse... button. Browse to the add-ins listed in step 2 (usually found in C:\Program Files\Narrative1) and select them. Click on the Open button. Click on the Microsoft Office Button and then click Word Options. The Word Options window appears. From the left-hand tool bar, select Add-ins. At the bottom of the window, select Word Add-ins from the Manage: dropdown. Click on the Go... button. The Add-ins window appears. Click on the Microsoft Office Button then click Excel Options. The Excel Options window appears. At the bottom of the window, select Excel Add-ins from the Manage: dropdown. Click on the Go... button. The Add-ins window appears. Occasionally you will need to restart either Word or Excel following the manual selection of add-ins. Occasionally, when a user accesses comps in the Sales Grid or copies of the Sales Grid, the Percent Office field does not display. This phenomenon occurs because the Microsoft Excel cells are not formatted to display values stored as percentages. To remedy this, the cell formats must be changed. Place your mouse pointer on the row header of the row that will display the Percent Office values. All values in the row will be highlighted. Right-click on the row header. A pop-up menu appears. Select Format Cells... The Format Cells window appears. Select the Number tab. Select Percentage from the Category: list. Click on the OK button. Select the Review tab and click on the Unprotect Sheet icon.